COLUMBUS, Ohio (CNS) — Philadelphia Archbishop Charles J. Chaput said that although people have good reason to feel anger toward the Catholic Church and fear for its future, those emotions can be viewed as signs of hope, depending on how the church responds to them. “There are days when everyone in the church seems angry,” Archbishop Chaput said. “Laypeople and priests are angry with their bishops for the abuse scandal, which never seems to end. Bishops are angry with priests for their bad example. And many bishops are also frustrated — to put it gently — with Rome for its unwillingness to acknowledge the real nature and scope of the abuse problem. “Clerical privilege is not the problem,” he continued. “Clericalism may be a factor in the sexual abuse of minors, but no parent I know — and I hear from a lot of them — sees that as the main issue. Not naming the real problem, for what it is — a pattern of predatory homosexuality and a failure to weed that out from church life — is an act of self-delusion. He was referring to March 14 by Cardinal Reinhard Marx, president of the German bishops’ conference, who said the Catholic Church in Germany was at a point where serious debate — including on priestly celibacy and the role of women — and openness to doing things in a new way must be encouraged. “I don’t want to diminish that anger because we need it,” he said. “What we do with that anger, though, determines whether it becomes a medicine or a poison. The church has seen corruption, incompetence and cowardice in her leaders, including in her bishops and popes, many times in the past — many more times than most Catholics realize. The fact that Americans are notoriously bad at history and ignorant of its lessons only compounds the problem. Noting that the first words of St. John Paul II upon becoming pope were “Be not afraid,” Archbishop Chaput said, “The temptations to fear, anxiety, depression and fatigue are experiences we all share, especially in hard moments for the church, like today. Fear, like anger, is a good and healthy thing when it’s in its proper place, and toxic when it’s not. The central question for us is “do we really believe in Jesus Christ or not? … Everything turns on the answer,” he said. Archbishop Chaput said that as Father Joseph Ratzinger, the future Pope Benedict XVI, predicted in 1969, the Catholic Church has become smaller and lost much of its influence. in the coming years. 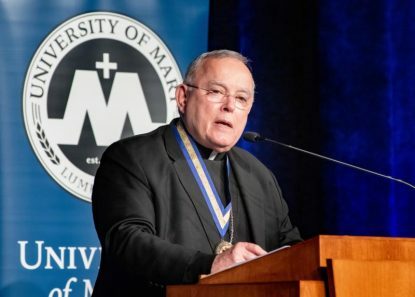 “We’re being driven closer to the one simple truth from which the church draws her purpose and strength: God incarnate in Christ, the author of our salvation and life eternal,” Archbishop Chaput said.